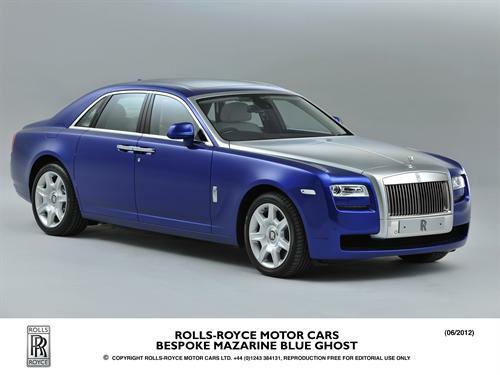 Rolls-Royce Motor Cars has released information on the 2013 model year Ghost. The changes are small, but fitting with the times in this latest release. A new soft, natural grain leather is being used along with the signature Rolls cross-banded wood veneers for an interior atmosphere of sumptuous luxury. The sound system has also seen some changes, with an upgraded amplifier and new "exciter" speakers hidden in the leather headlining to provide top-notch sound inside the luxury coach. As is the norm in Rolls-Royce coaches, the sound is tuned to the passenger's ear. The comfort features offered in 2012 will be carried forward for the 2013 model year, with the addition of Comfort Access. This is a new, first-of-its-kind convenience feature that allows the opening of the boot (trunk) with a foot movement similar to the option Ford showcased in its new Escape. This allows the chauffeur or valet easy access when hands are full, provided the key fob for the car is nearby. Finally, the addition of a new forged alloy wheel option finishes off the new option offerings for 2013. A total of 44,000 exterior paint options are available on the Ghost to suite any owner's taste. The new 2013 Rolls-Royce Ghost took inspiration from the Bespoke Ghost Si Sense collection (pictured here) and begins production later this fall for 2013 sales. Pre-orders will commence at dealerships world wide at that time.